· Jimmie Johnson won the 21st annual O’Reilly Auto Parts 500 Monster Energy NASCAR Cup Series race at Texas Motor Speedway Sunday afternoon. For Johnson, it is his 81st victory in 550 Monster Energy NASCAR Cup Series races. It is his first victory of 2017, and his initial victory since claiming the 2016 Ford EcoBoost 400 at Homestead-Miami Speedway when he captured the Monster Energy NASCAR Cup Series championship. · Johnson won today’s race starting from the rear of the field due to a tire change following qualifying. He is the first driver to win a race starting from the rear since he did it in the 2016 Ford EcoBoost 400 at Homestead-Miami Speedway. · It is Johnson’s seventh win in 28 starts at Texas Motor Speedway, as there are now four tracks at which Johnson has notched seven or more victories (Dover-10, Martinsville-9, Charlotte-8). Johnson also has amassed 21 top-10 finishes and 15 top-5s at Texas. · It marks his 16th straight season with at least one win. · Kyle Larson (second) posted his third top-10 finish in eight races at Texas Motor Speedway. It is his best finish at Texas. It also marks his fifth top-5 finish in seven races this year. · Joey Logano (third) posted his eighth top-10 finish in 18 career Monster Energy Series races at Texas Motor Speedway. It is his best finish of 2017 and he has now finished in the top-6 in six of the seven races this year. · Dale Earnhardt Jr. finished fifth today, his first top-5 showing since he finished second on June 6 of last year at Pocono. · Ty Dillon (17th) was the highest finishing rookie today. · Ryan Blaney won both Stage 1 and 2 of today’s race. · Kyle Larson (315) leads the point standings by 17 points over Chase Elliott (298). They are followed by Martin Truex Jr. (275) and Brad Keselowski (274). 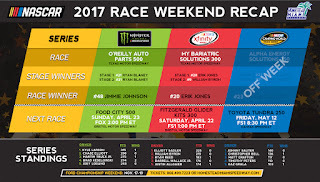 · Through seven races of the 26-race regular season, six drivers have qualified for the 16-driver field of the 2017 Monster Energy NASCAR Cup Series Playoffs, a list consisting of Kurt Busch, Brad Keselowski, Martin Truex Jr., Ryan Newman, Kyle Larson and Jimmie Johnson, each of who has won at least one race this season. The Playoffs culminate with the Ford EcoBoost 400 championship finale on November 19 at Homestead-Miami Speedway. · In 16 career Monster Energy NASCAR Cup Series starts at Homestead-Miami Speedway, Johnson has posted one win and 11 top-10 finishes, including five in the top-5. He has celebrated all seven of his Monster Energy NASCAR Cup Series championships at Homestead-Miami Speedway, most recently in 2016 when he took the checkered flag at the Ford EcoBoost 400. 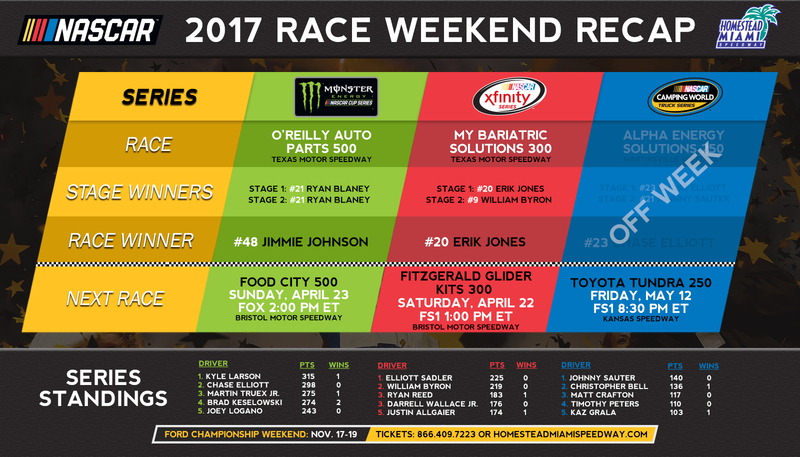 · Erik Jones won the 21st annual My Bariatrics Solutions 300 NASCAR XFINITY Series race at Texas Motor Speedway on Saturday afternoon. It is Jones’ seventh victory in 63 career NASCAR XFINITY Series races. · It is his second victory and fifth top-10 finish in five career XFINITY Series races at Texas Motor Speedway. Jones also captured Stage 1 of the race. · Rookie William Byron took Stage 2 of the race. · Ryan Blaney (second) accounted for his fourth top-10 finish in as many XFINITY Series races at Texas Motor Speedway. · Kevin Harvick (third) posted his 17th top-10 finish in 20 career XFINITY Series races at Texas Motor Speedway. · Cole Custer (fifth) was the highest finishing rookie as well as the highest finishing XFINITY Series regular. · Elliott Sadler (225) leads the XFINITY Series points standings by six points over rookie William Byron (219), winner of the 2016 Ford EcoBoost 200 Camping World Truck Series race at Homestead-Miami Speedway. They are followed by Ryan Reed (183), Bubba Wallace (176) and Justin Allgaier (174).